Baycorp staff from Australia, New Zealand and the Philippines recently gave up their Saturday to do community work in our ‘Day of Giving’. This is something we’re really proud of in more ways than one. 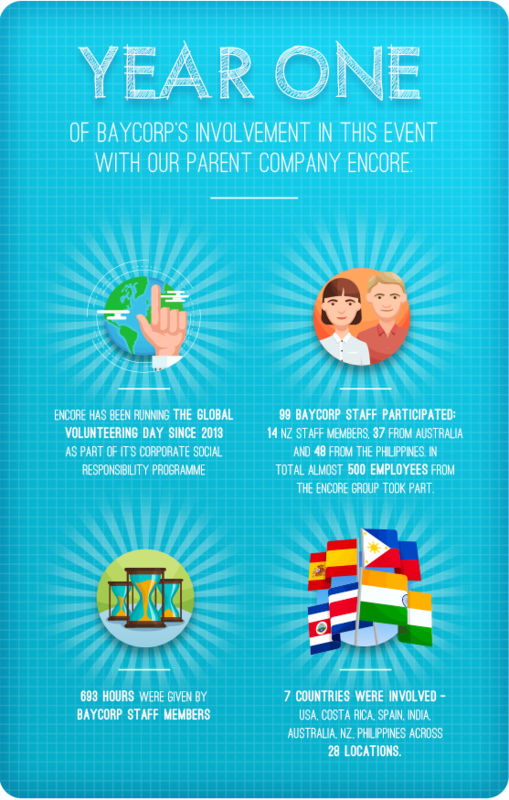 This is the first time all the Baycorp sites have simultaneously participated in an event like this. What’s more exciting is that this was the first time we were involved in the annual Global Volunteering day organised by the Encore Capital Group, our parent company. We’re excited to say this initiative was a tremendous success with almost 20% of our staff being involved. Below is an infographic showing our contribution along with some photos. Enjoy.